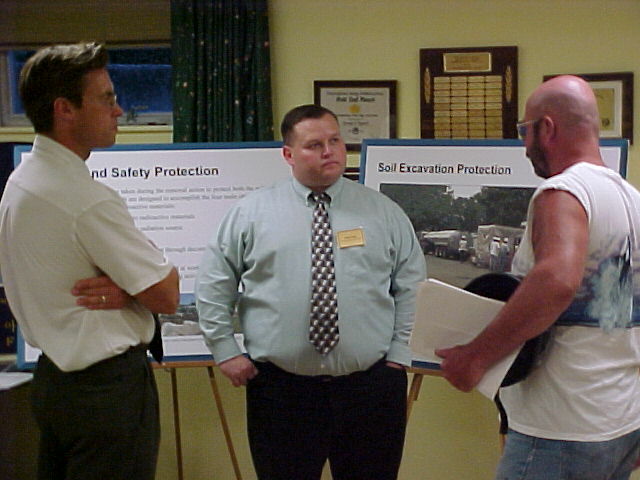 These photos represent the range of activities the Corps has undertaken since assuming responsibility for the Maywood site (in November 1997) up to the present. 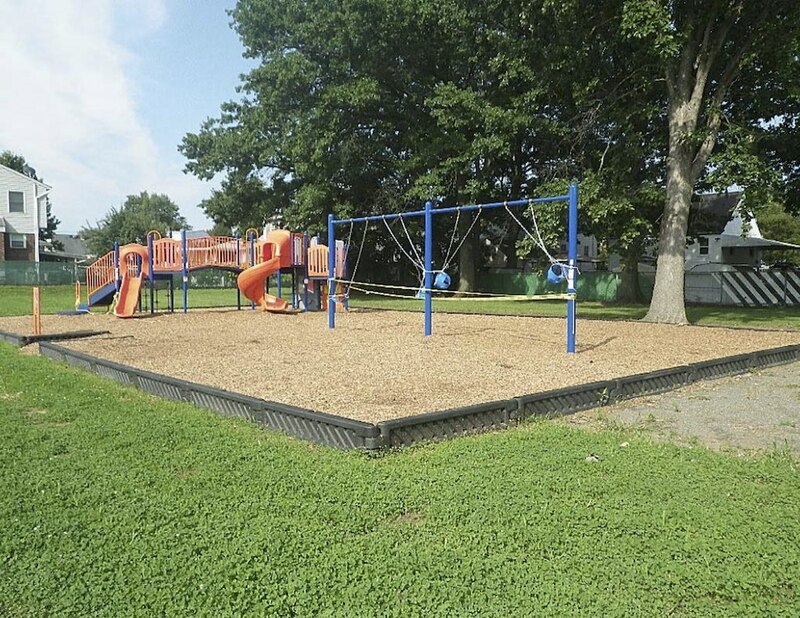 The Corps maintains a robust community involvement program at the Maywood Site. 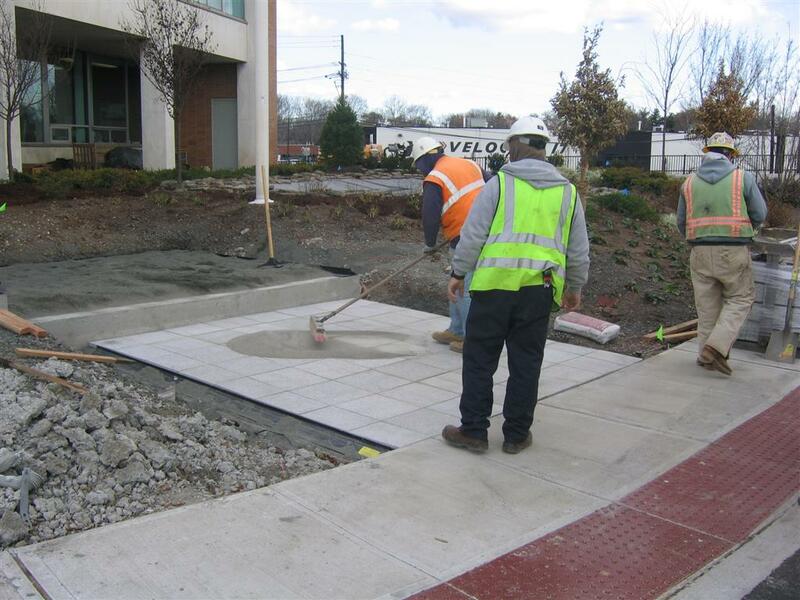 Given the commercial nature, proximity to residences, and land use pressures at most site vicinity properties, the Corps has established close working relationships with property owners, their employees, contractors, tenants, utilities, neighbors, local officials, and the greater community. 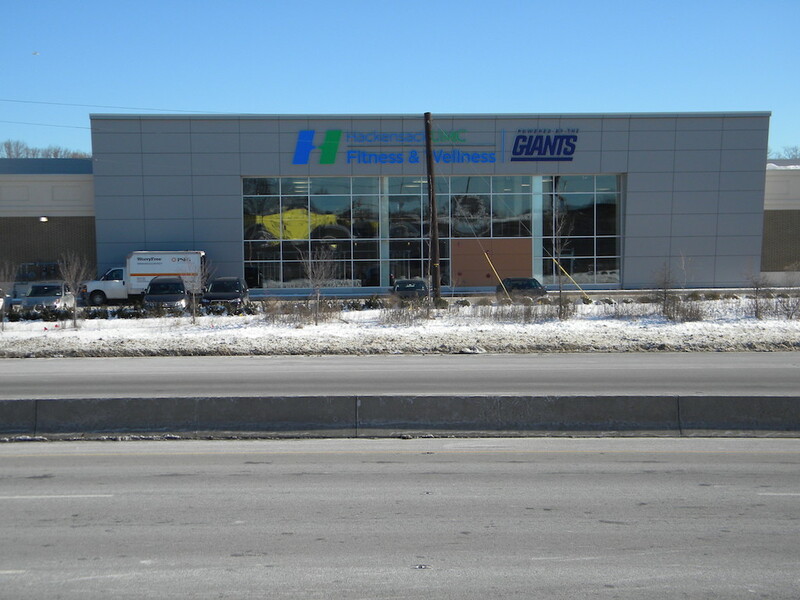 In addition to this website, the Corps also maintains a storefront Public Information Center in Maywood's central business district. 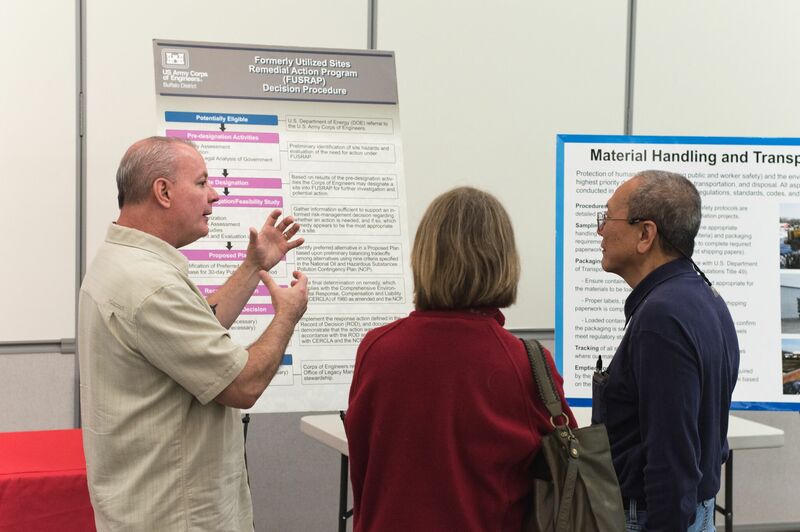 Community members and USACE representatives engaging at a recent public information session. 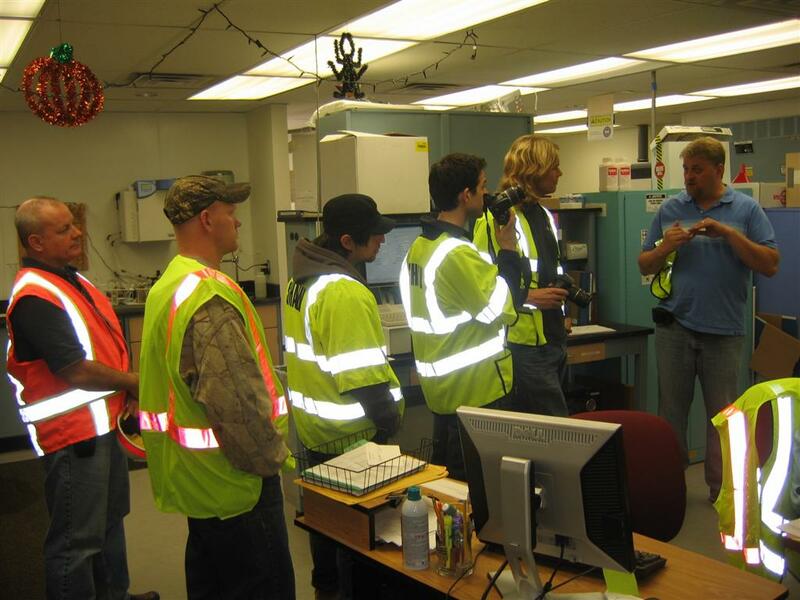 Environmental science students from a nearby college tour the FUSRAP Maywood onsite lab. 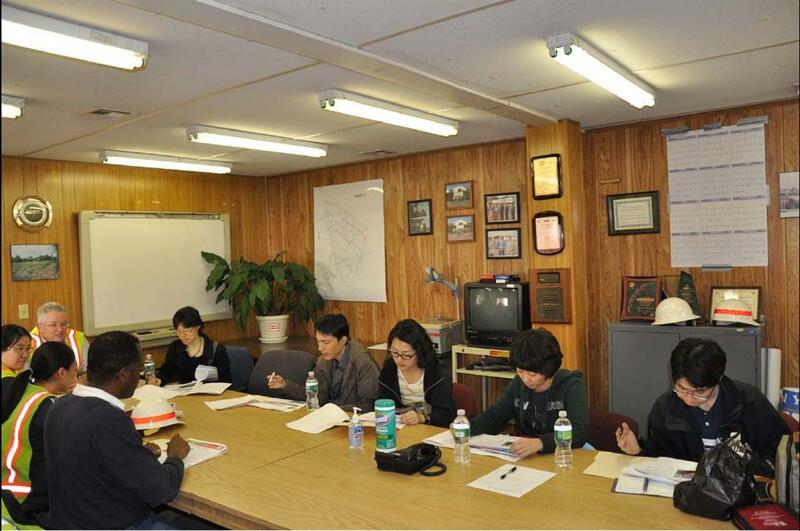 Visitors from a Korean university receive an onsite briefing. 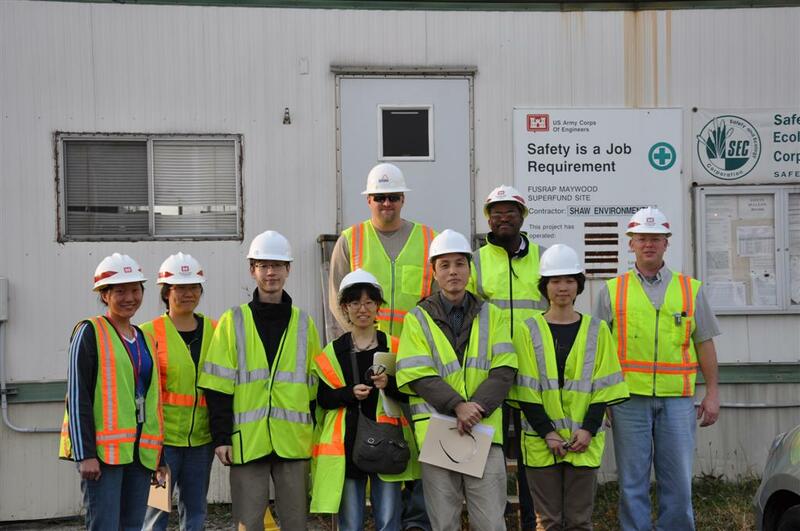 Student visitors from Korea and project representatives during a site visit. 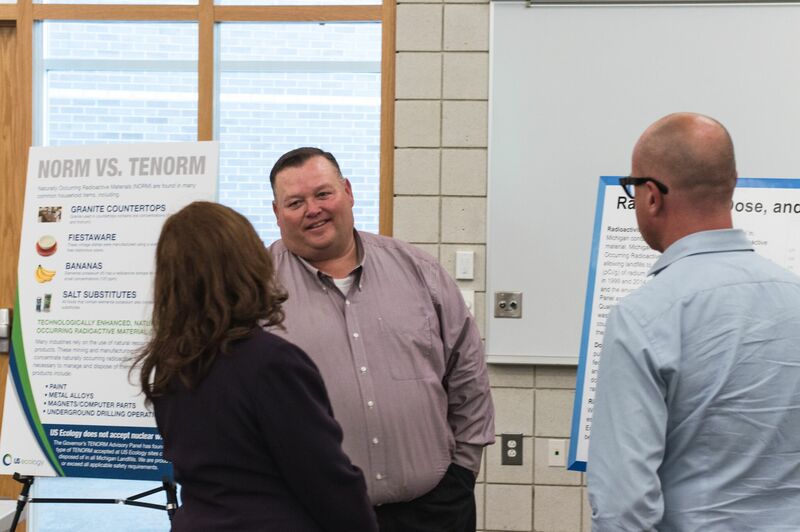 To learn more about Public Involvement, click here. 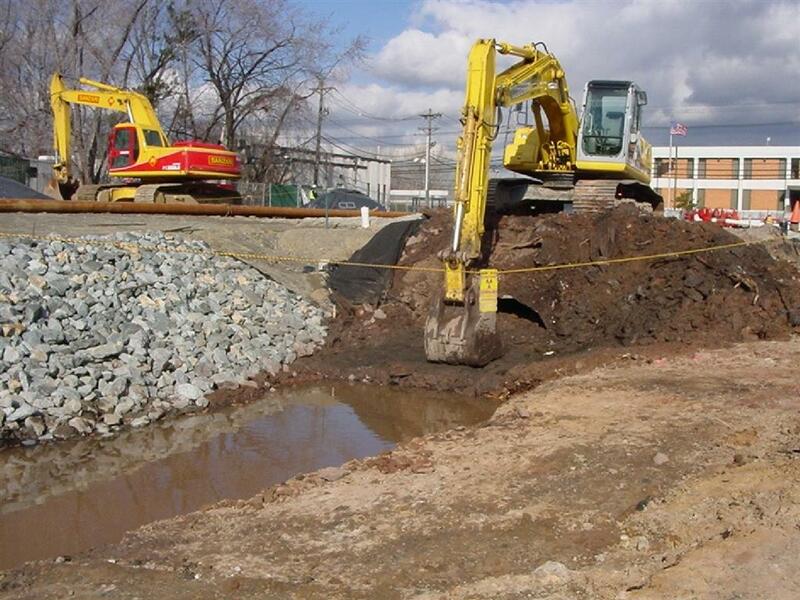 Together, the Army Corps and its remediation contractors have compiled an outstanding safety record at the Maywood Site. 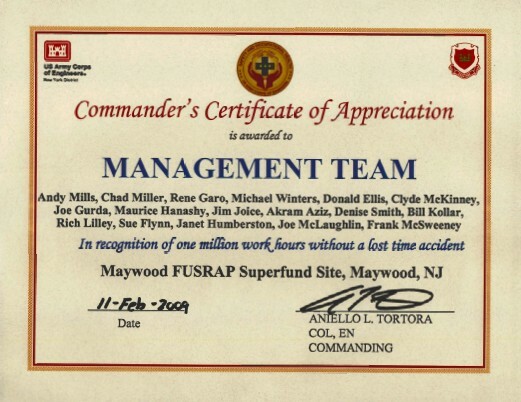 The project passed one million hours worked without a lost time accident (LTA) in December 2008, out of more than 1.4 million hours worked since project startup. 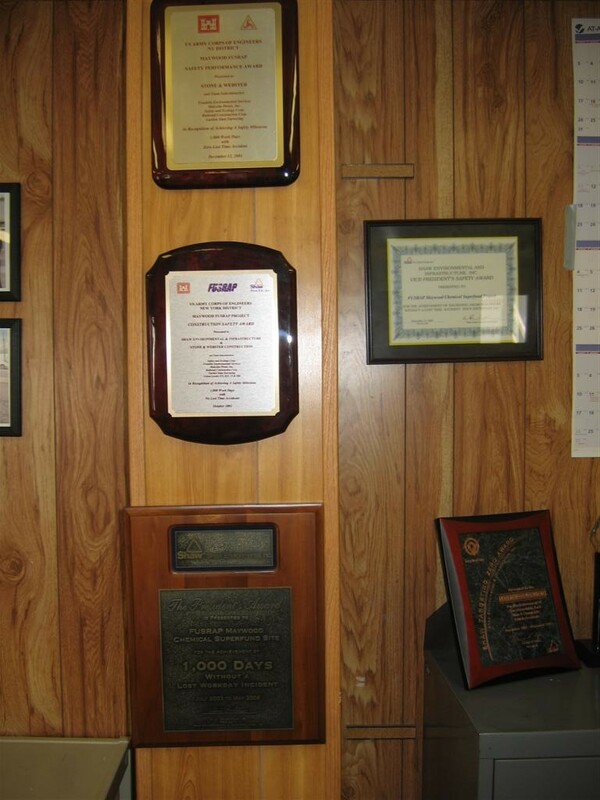 This achievement was recognized with the New York District’s Commander’s Certificate of Appreciation awarded to the project in February 2009. 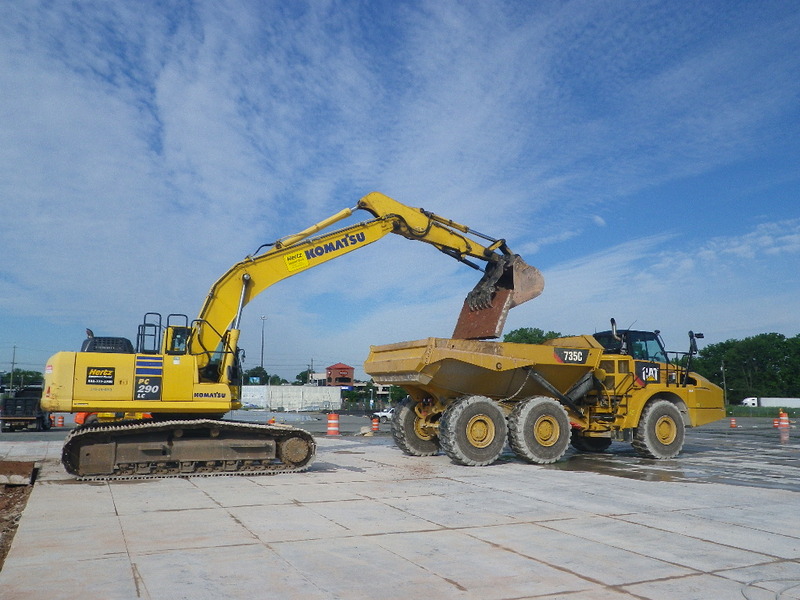 As of February 2018, the project has compiled over 2.4 million hours without an LTA, which equals more than 5,400 consecutive safe work days. 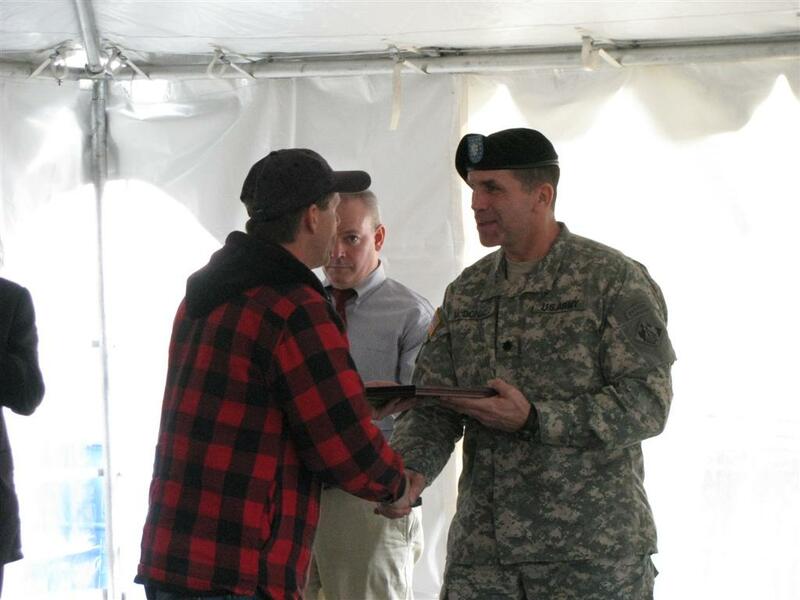 Lt. Col. Kenneth McDonald, at the time Deputy Commander and Deputy District Engineer for the Corps’ New York District, congratulates a FUSRAP Maywood Site employee at a 2009 onsite safety award presentation. 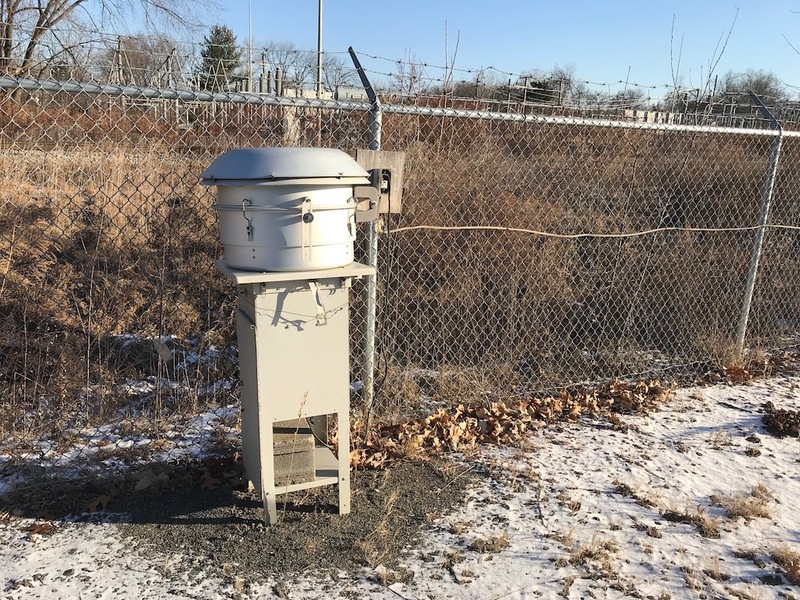 Groundwater investigations involve an in-depth field program to assess if and to what degree waste from the Maywood Site is affecting groundwater. 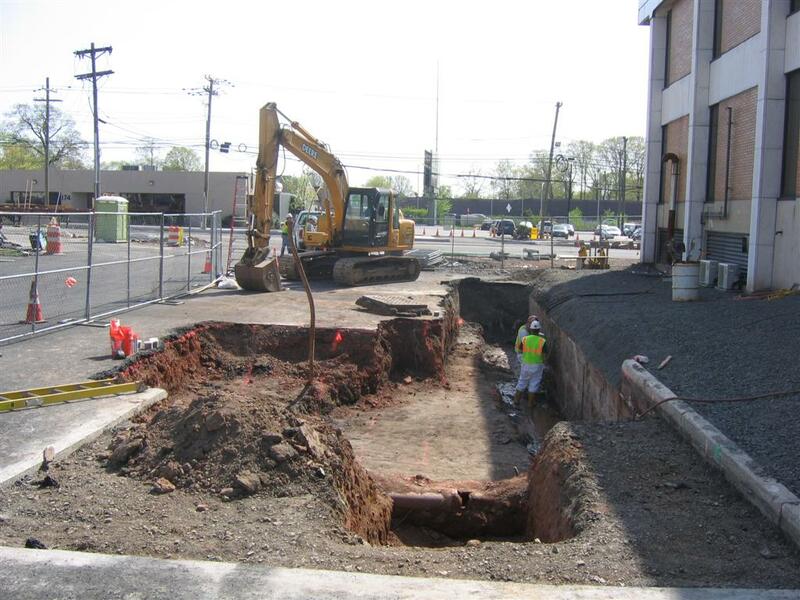 A groundwater monitoring well installation. 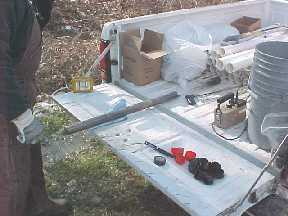 Field crew collecting a groundwater sample. 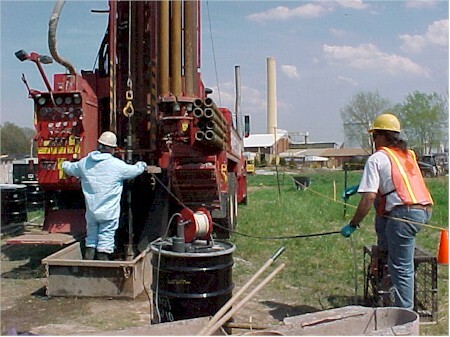 To learn more about groundwater investigations click here. 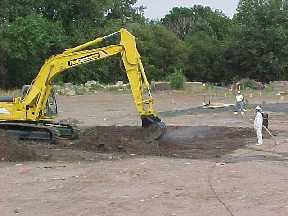 An air monitoring station at a remedial excavation site perimeter. 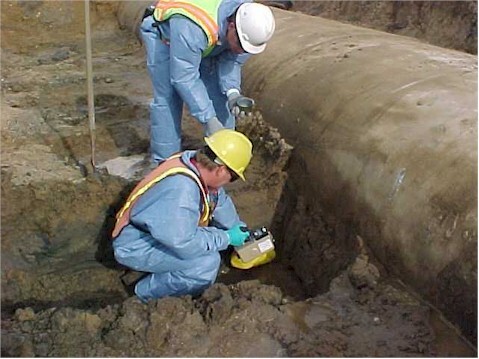 Site characterization combines radiological, geotechnical, and environmental studies to accurately define the nature and extent of contamination on a property. 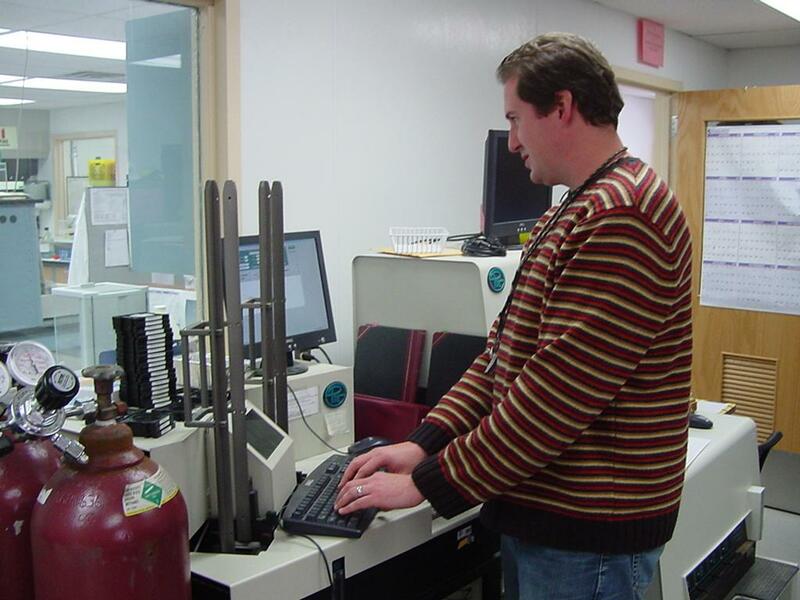 A worker sets the Geoprobe boring mechanism. 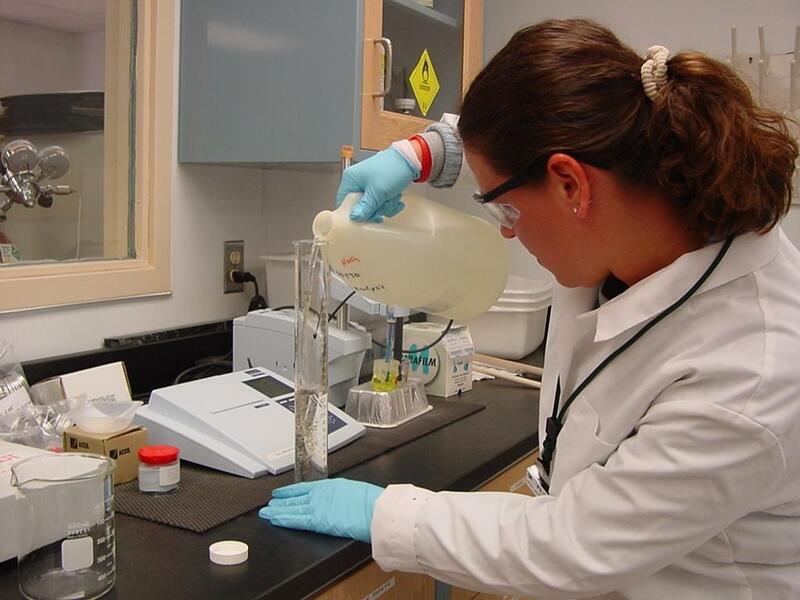 The probe sleeve contains the soil sample. 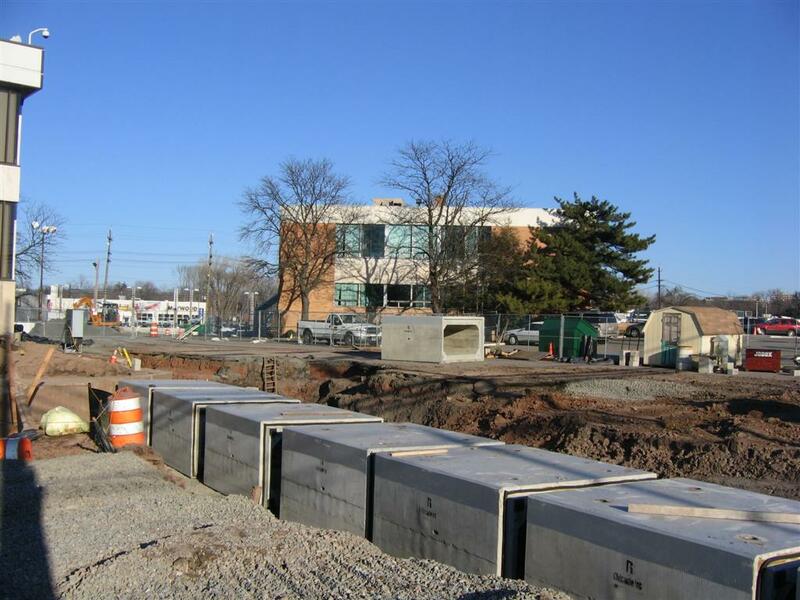 Engineering test pits provide information on an entire cross section of subsurface soil conditions. 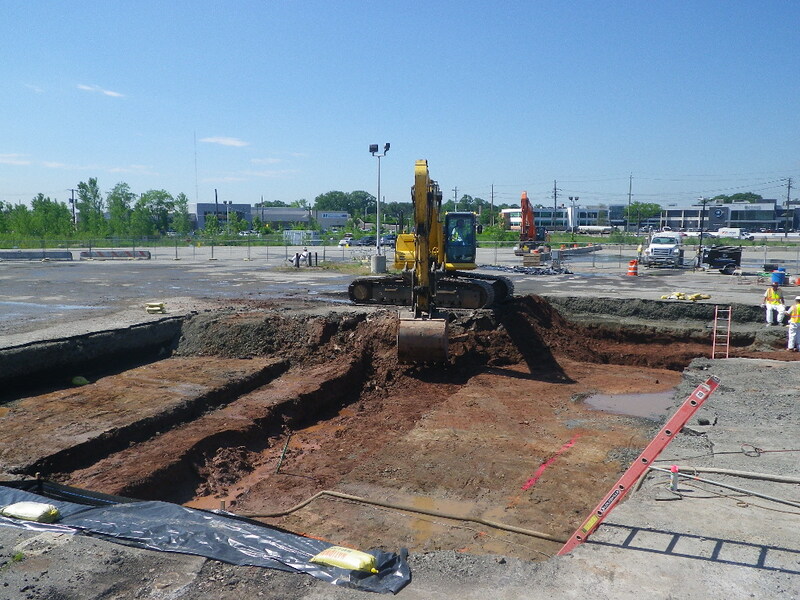 Excavated material from a test pit at a former retention pond. 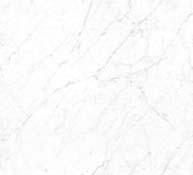 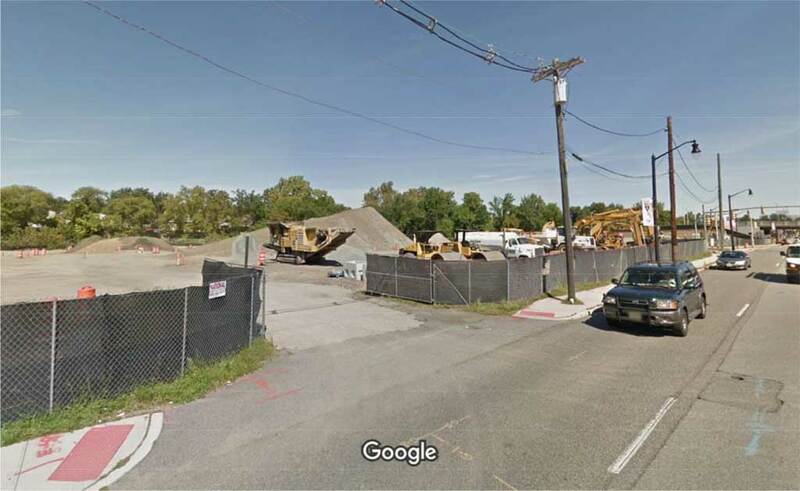 To learn more about Site Characterization click here. 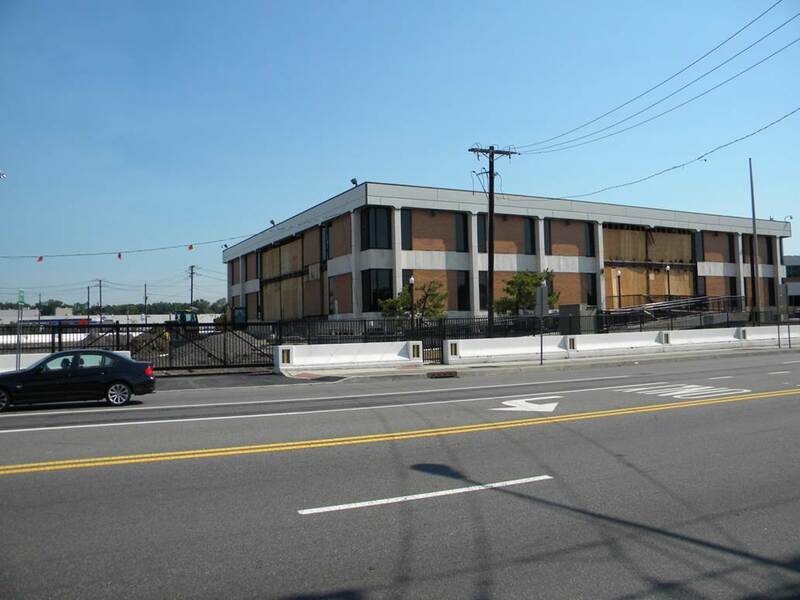 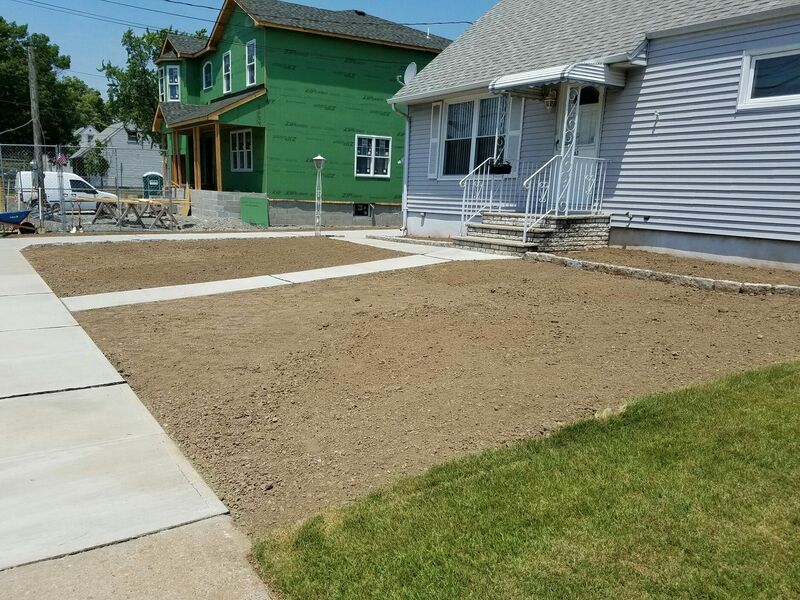 The Corps completed remediation of the 22 remaining residential vicinity properties shortly after assuming responsibility for the FUSRAP Maywood Site. 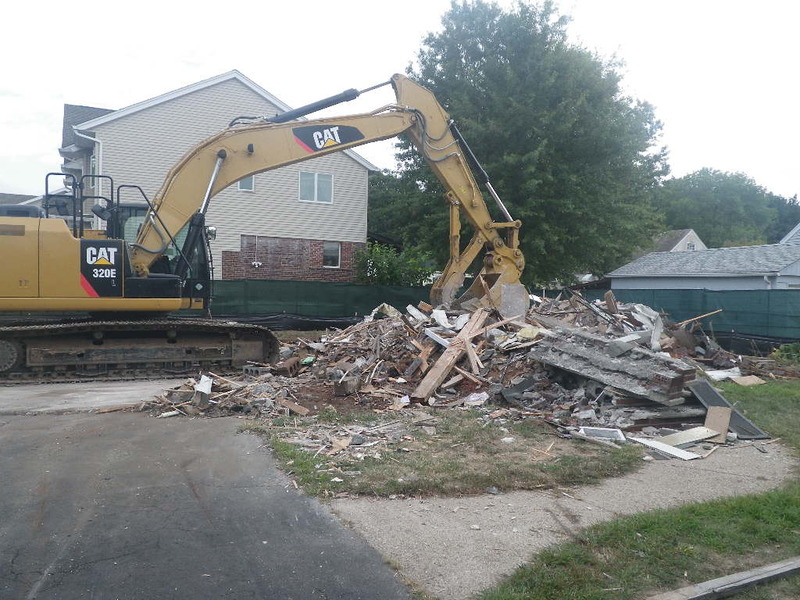 To learn more about Residential Cleanups, click here. 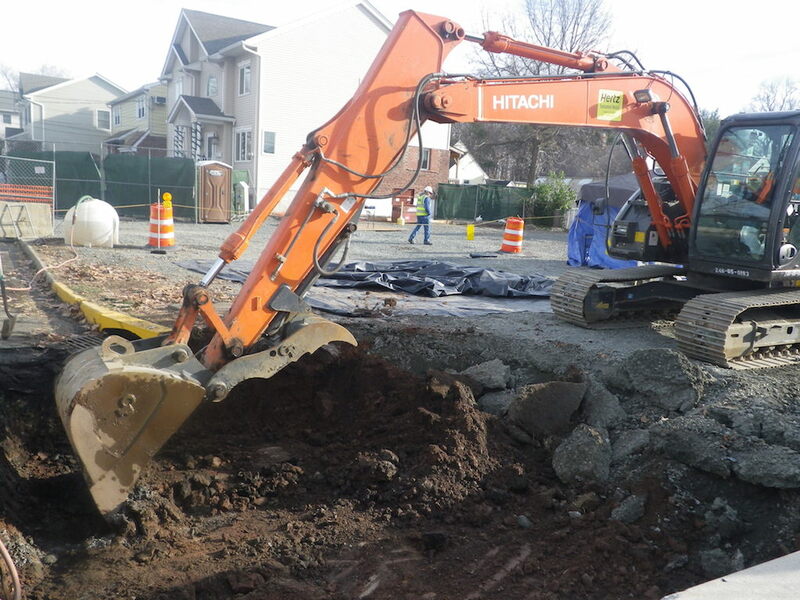 Scenes of remedial excavations at commercial site properties. 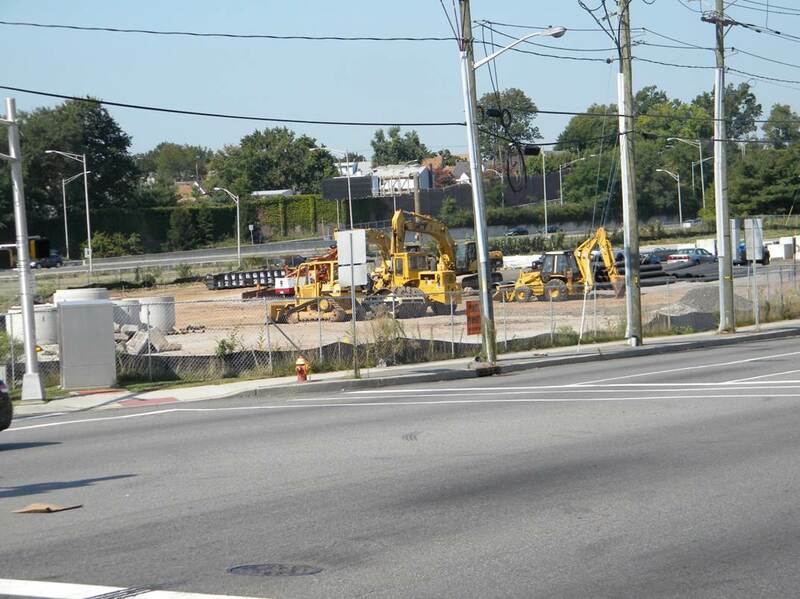 Remediation underway at Burial Pit 3 on the 100 West Hunter Avenue, Maywood vicinity property. 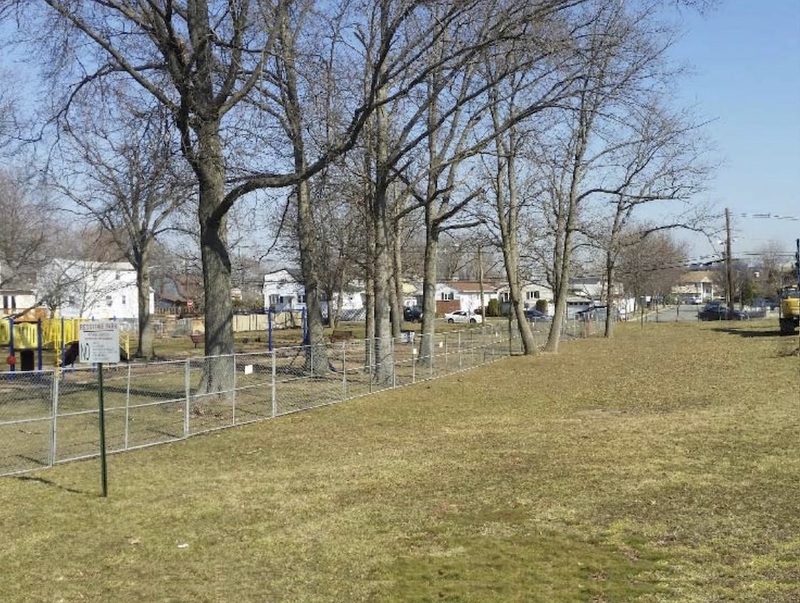 Cleanup at all three historic waste burial pits at this property was completed in 2011. 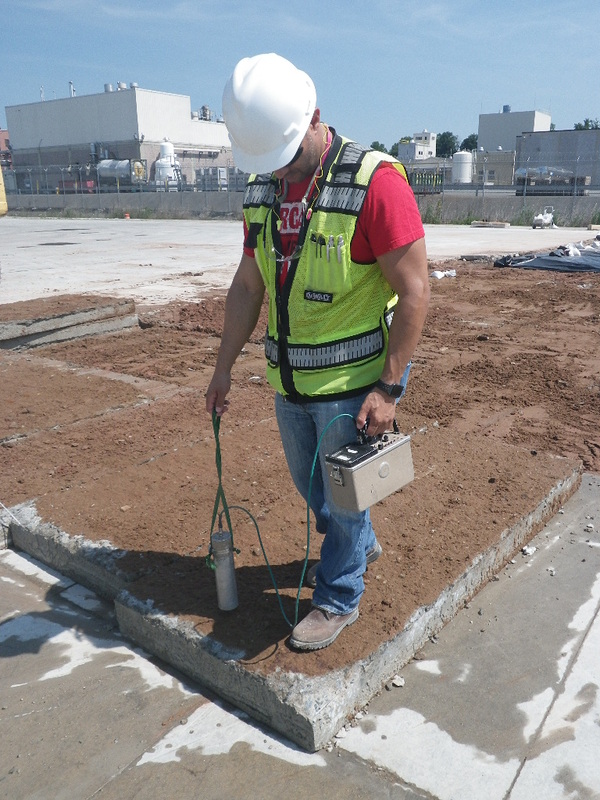 A radiation safety technician performing a surface walkover at a remedial excavation site. 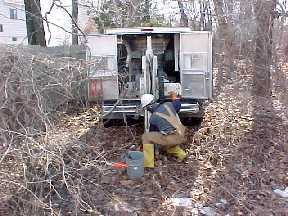 Technicians taking radiological measurements beneath the historic Lodi Brook culvert. 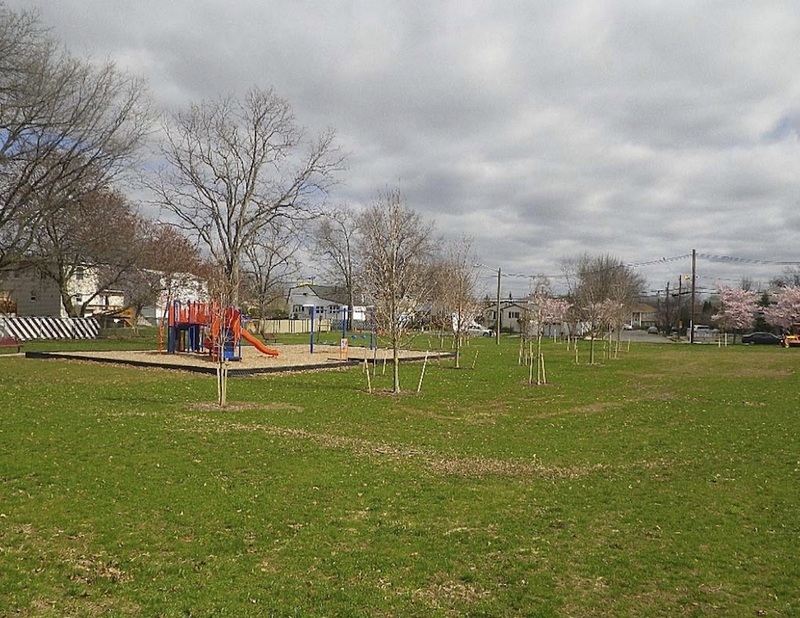 Redstone Lane Park had contaminated soil below an underground drainage pipe and around the roots of several mature trees. 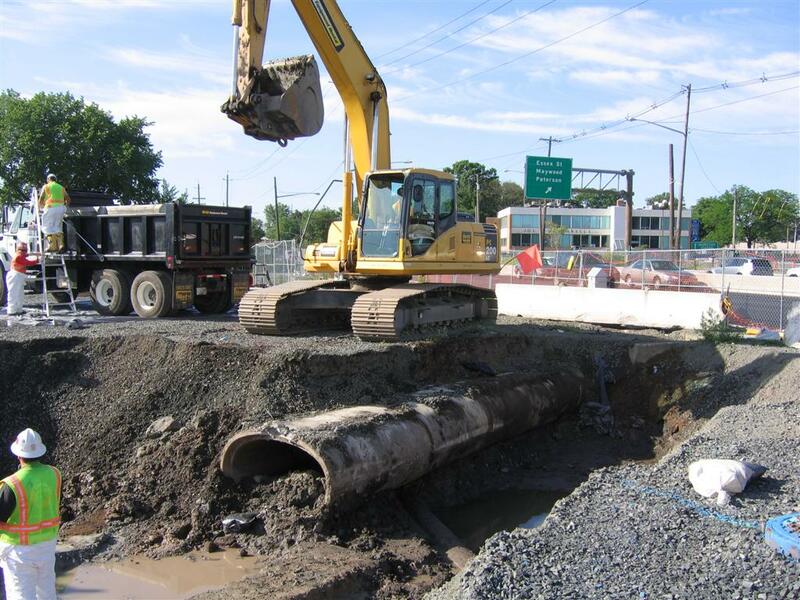 The soil was safely removed in two stages: Stage 1 addressed the pipe and Stage 2 addressed the tree roots, with a scheduled break between the stages during the peak use summer months. 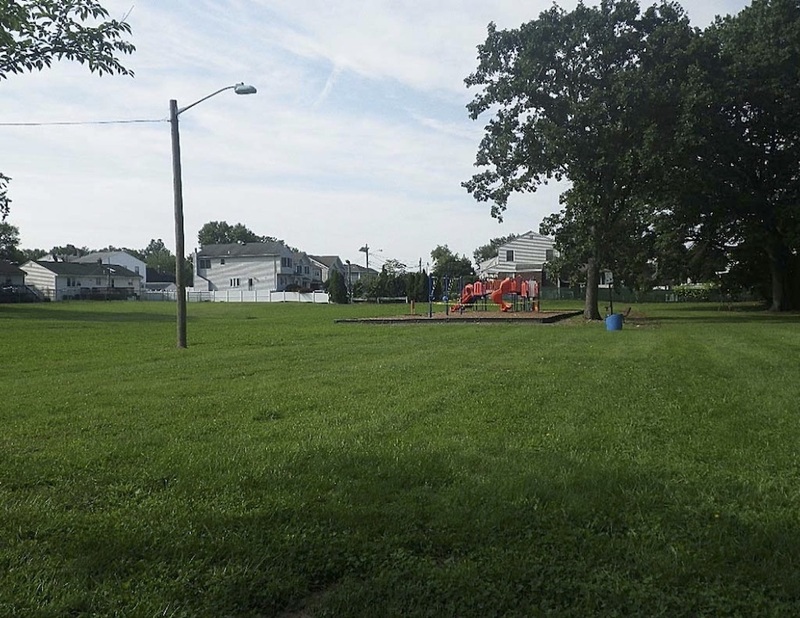 The fully restored Redstone Lane Park was reopened to the community in August 2017. 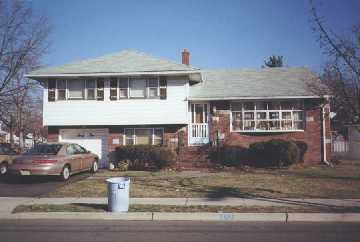 Redstone Park prior to remediation. 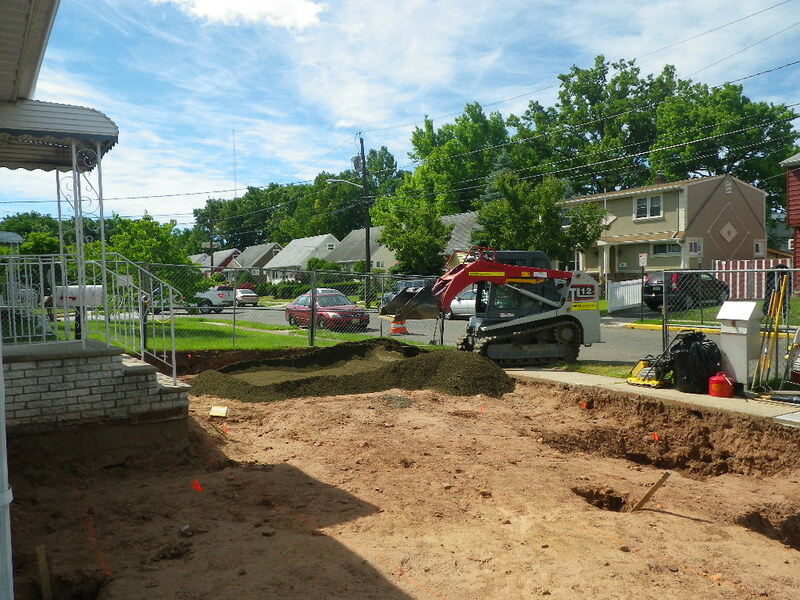 Soil removal around the drainage pipe and pipe replacement. 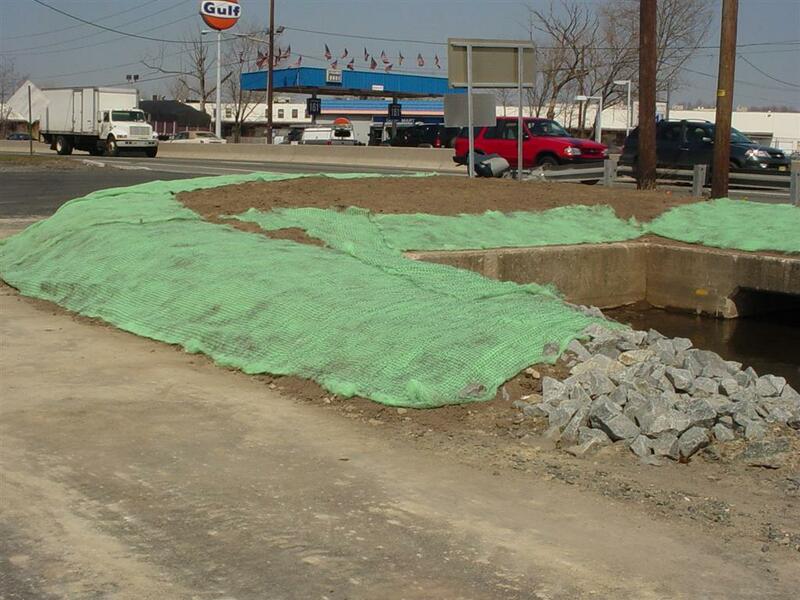 As of February 2018, the FUSRAP Maywood Project has successfully managed nearly 127 million gallons of construction water. 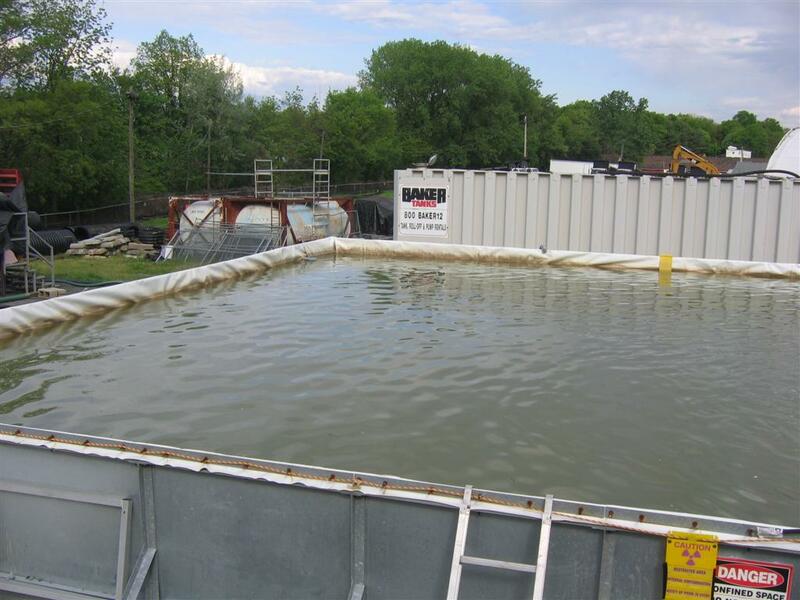 Water is either pumped directly from remedial excavations or into tank trucks for processing through an onsite water treatment system. 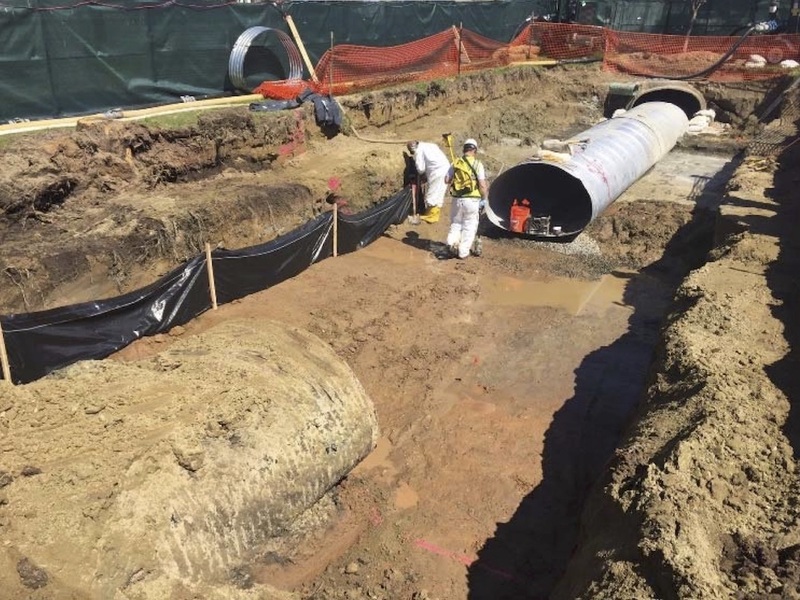 The water is treated to comply with standards for radiological constituents under the project's permit with the local utilities authority, and then discharged into the public sanitary sewer system. 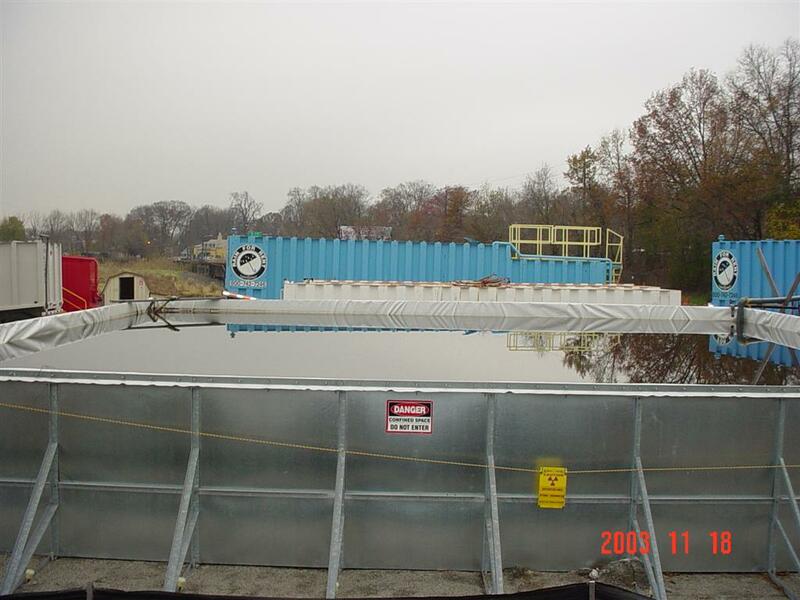 The modular settling tank at one of the onsite wastewater treatment units. 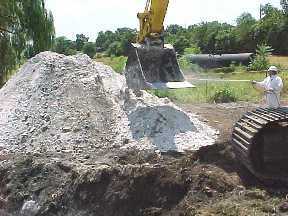 Another view of the settling tank. 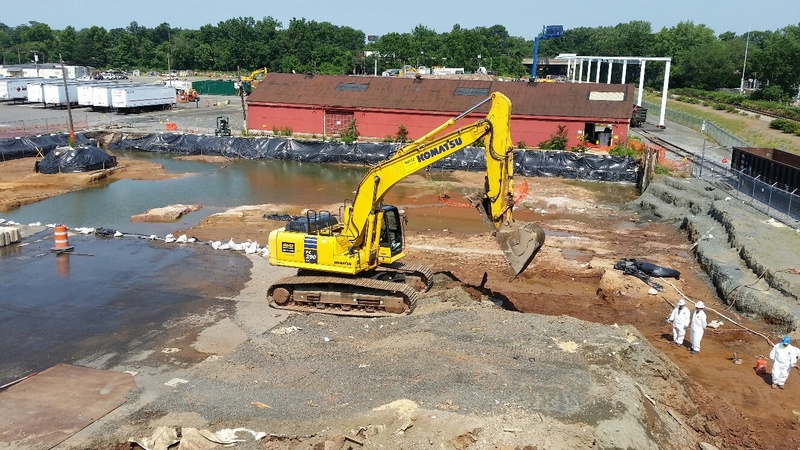 Wastewater is initially stored in the blue tanks in the background as it arrives from the excavation sites. 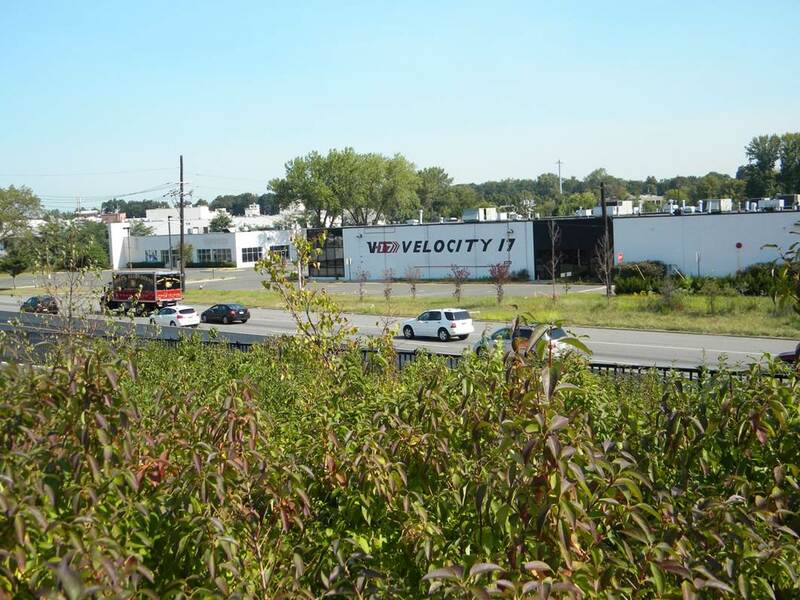 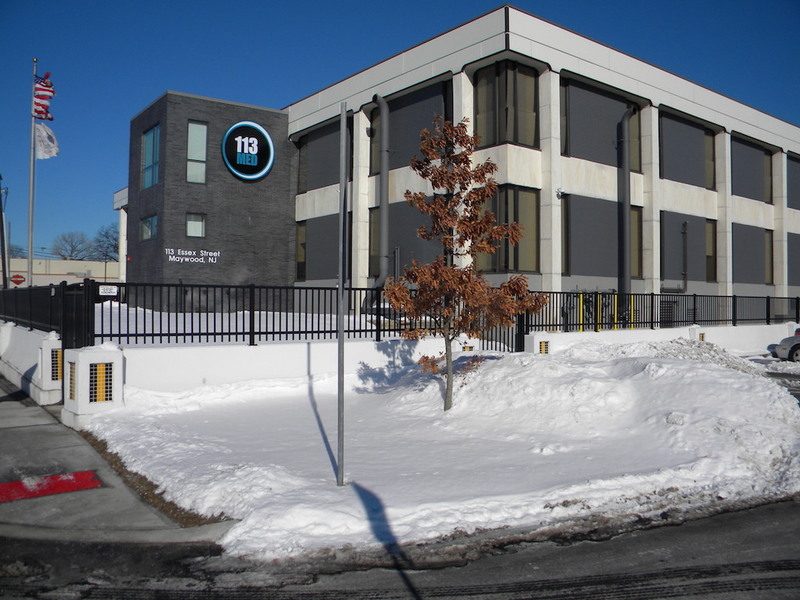 An onsite New Jersey DEP-certified and USACE-validated radiochemical laboratory is located at the MISS. 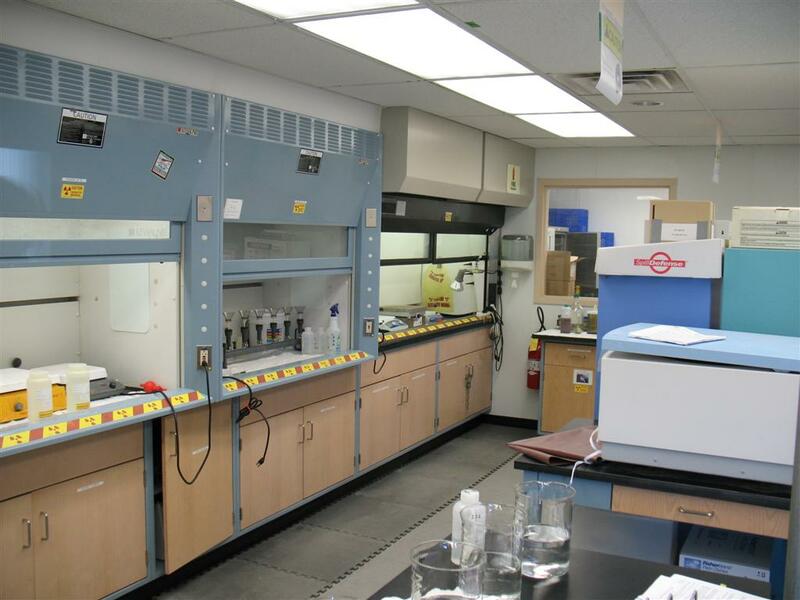 The lab allows for more control of radioanalytical turnaround time by providing real time data, which in turn saves valuable remedial construction time and costs. 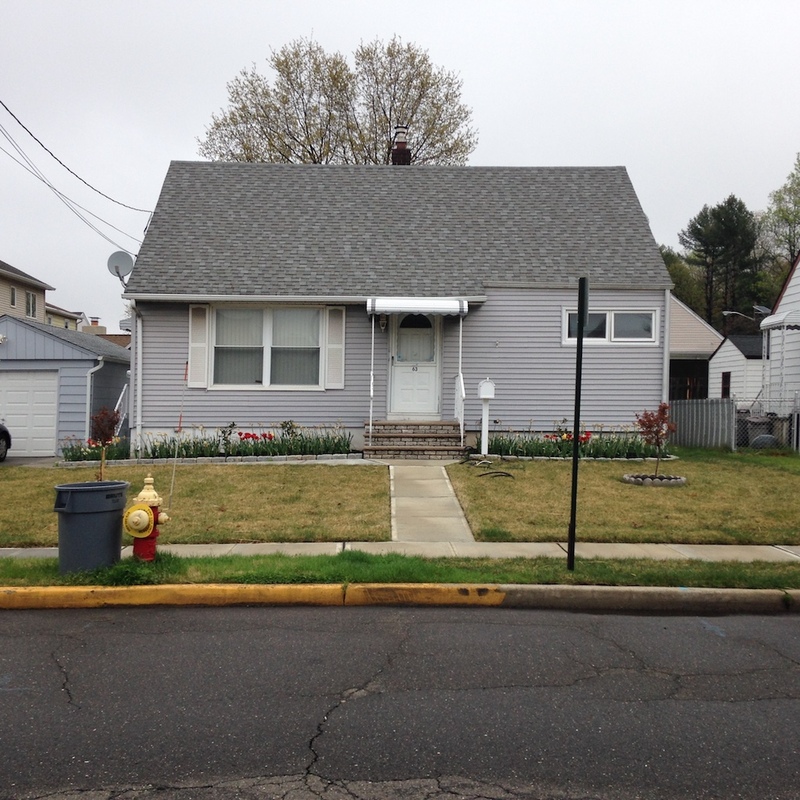 Following remediation, properties are restored to their original conditions. 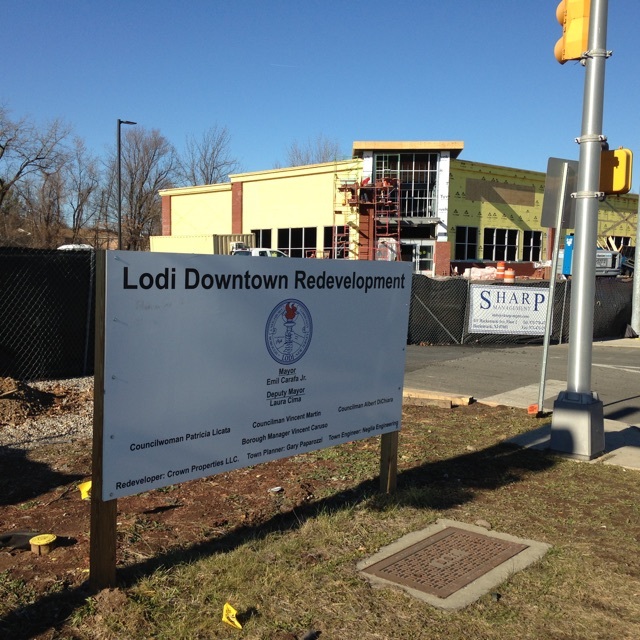 The photos below show various stages of the restoration process. 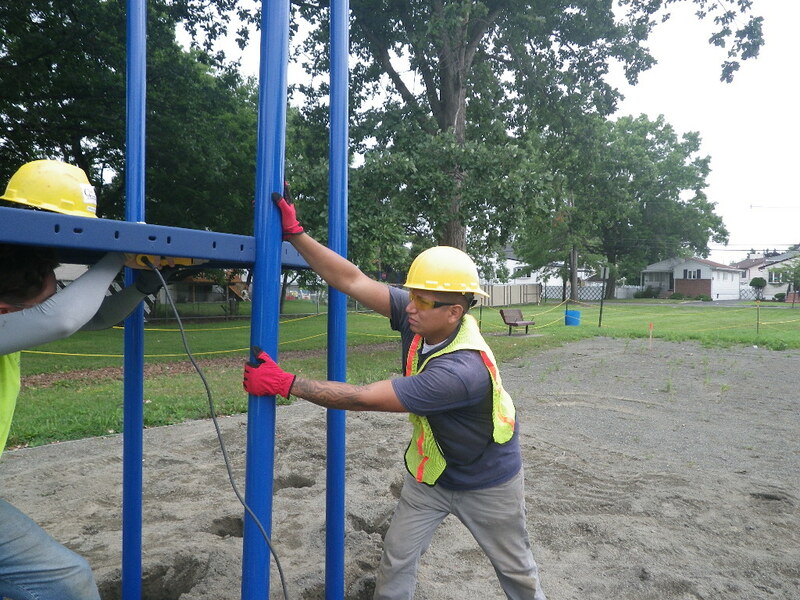 Installing playground equipment following remediation of a local park. 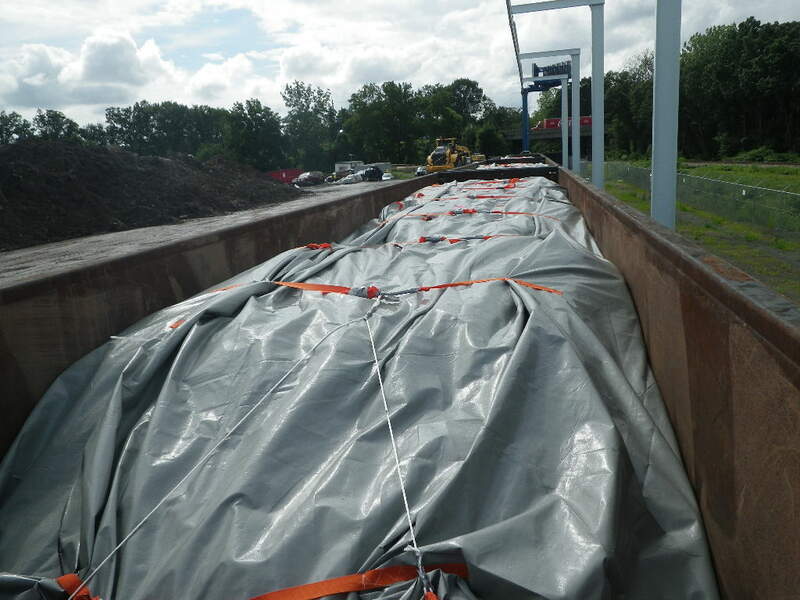 Soil generated from remedial excavations is loaded onto rail cars at the MISS and shipped to an authorized offsite disposal facility. 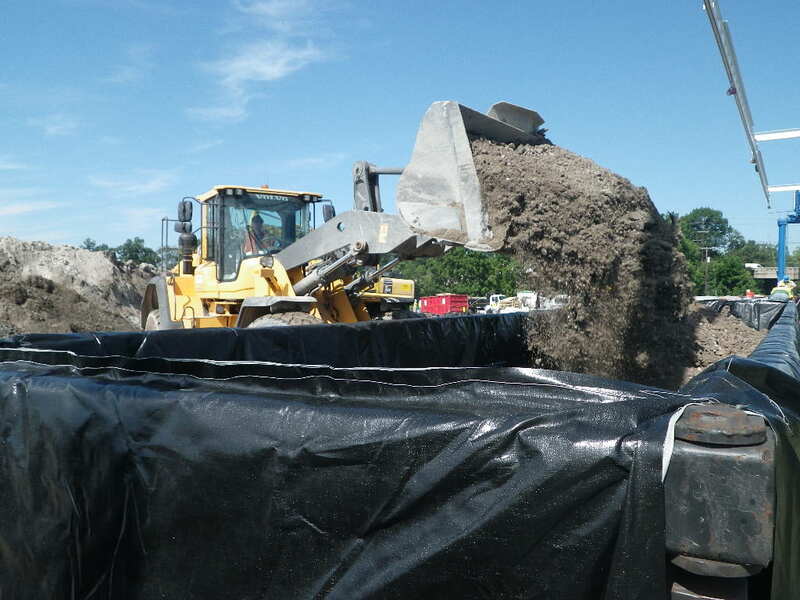 Soil being loaded into a rail car fitted with a sealable protective liner. 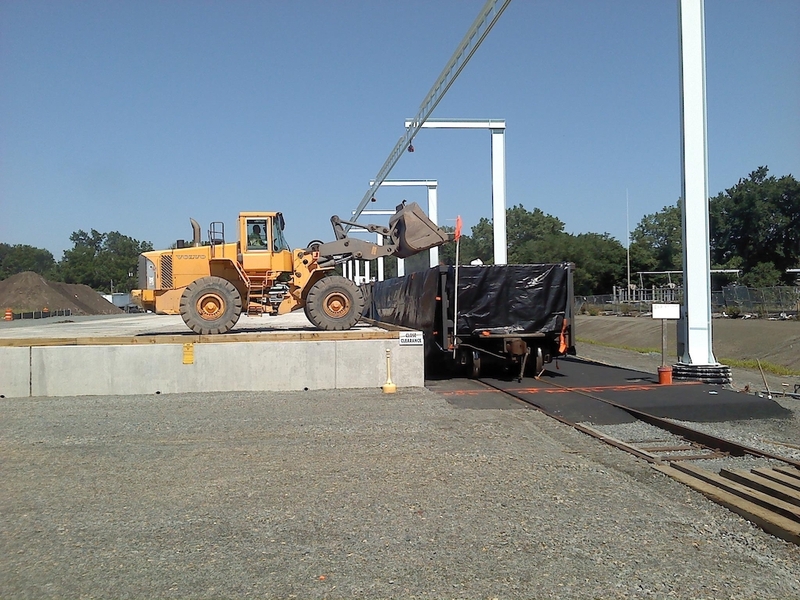 Workers securing rail car liner. 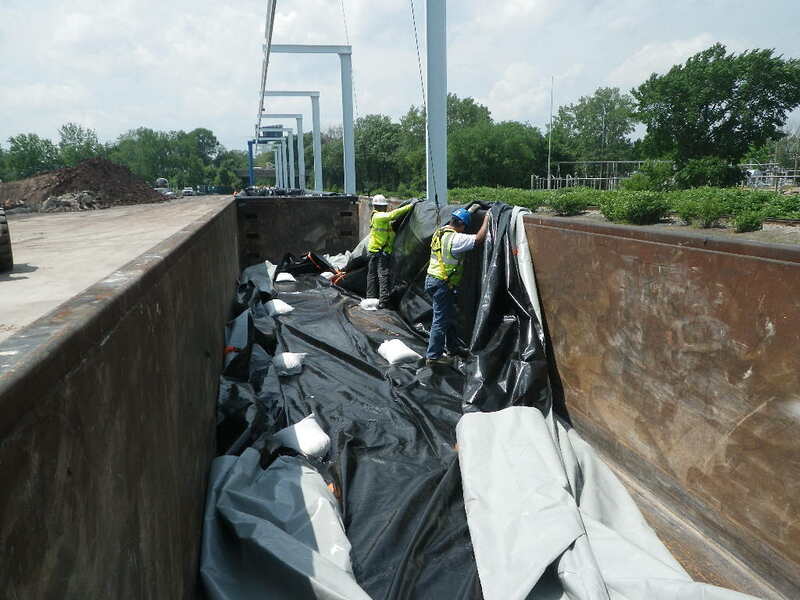 Workers securing another load for shipment. 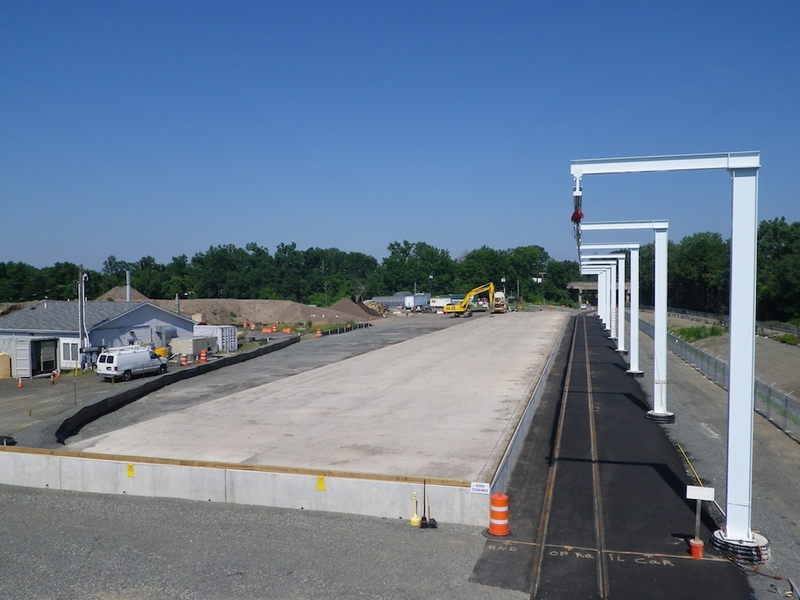 Each rail car holds approximately 65 cubic yards (about 107 tons) of soil. 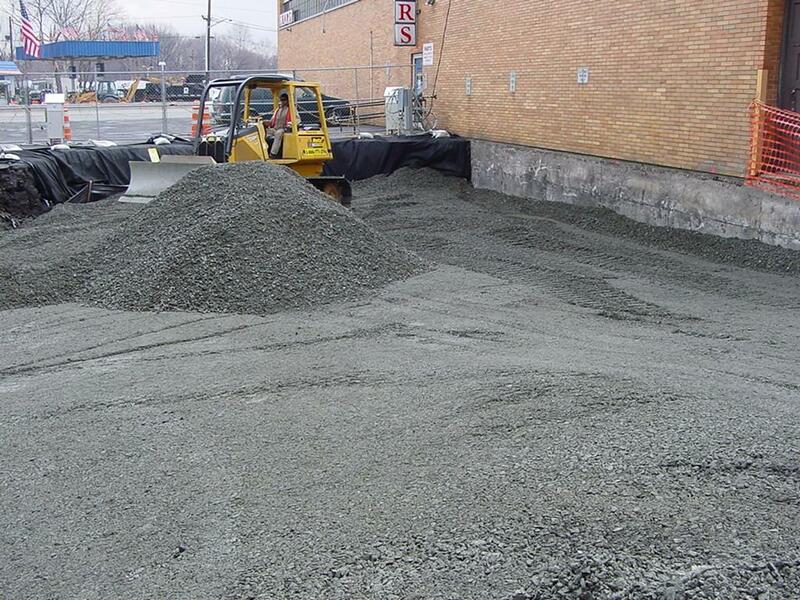 As of August 2018, the Corps has safely excavated and shipped over 685,000 cubic yards of contaminated soil to disposal facilities permitted to accept such materials. 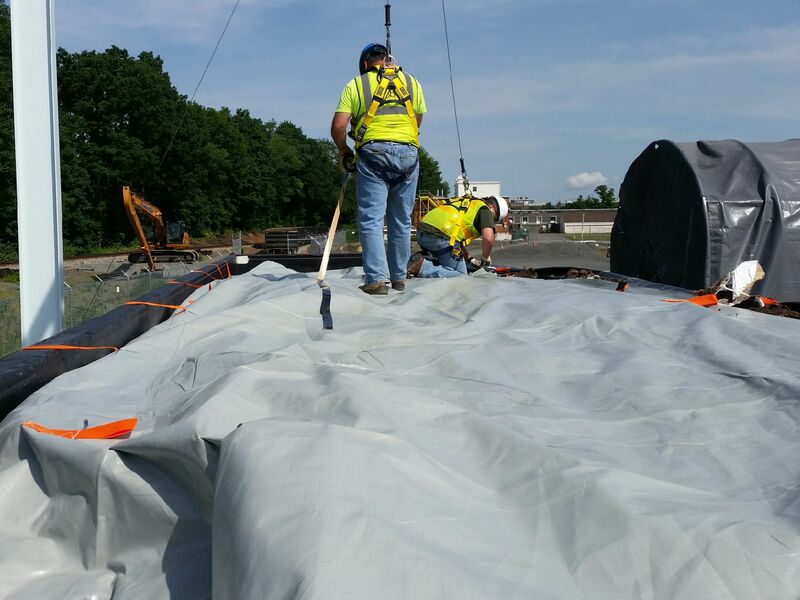 Workers check a rail car liner to make sure it is secure before leaving the site. 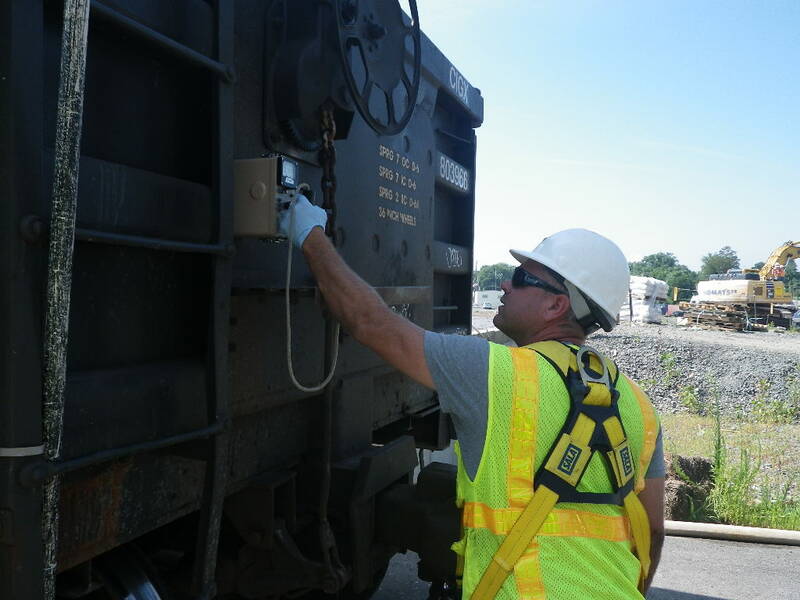 A radiation safety technician checks the outside of a rail car for any loose contamination prior to shipping. 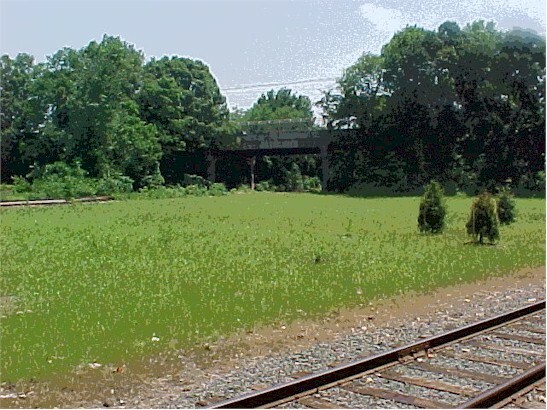 A secured rail car ready to ship. 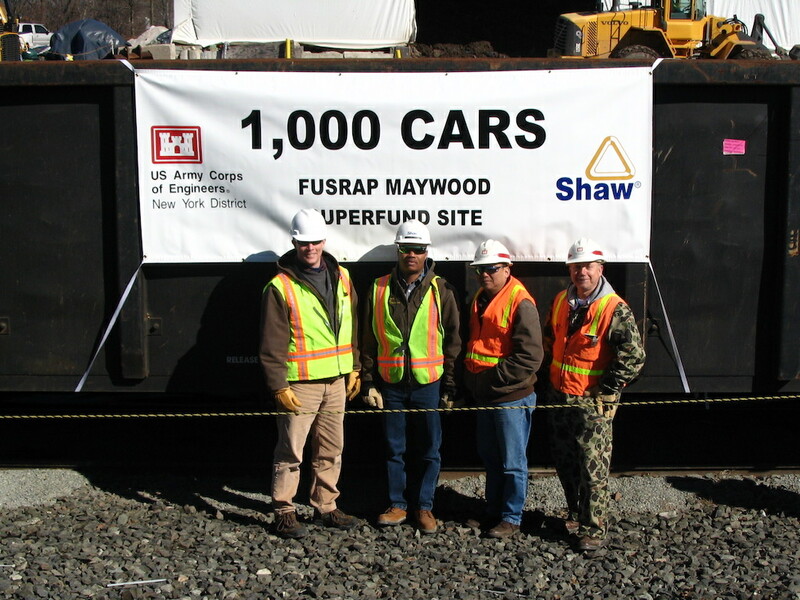 Army Corps and contractor personnel mark a soil shipment milestone at the FUSRAP Maywood Site. 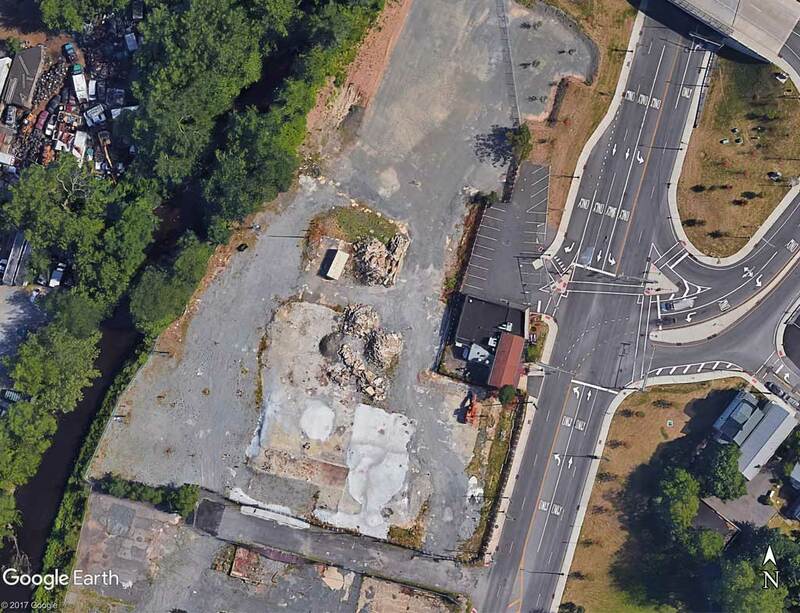 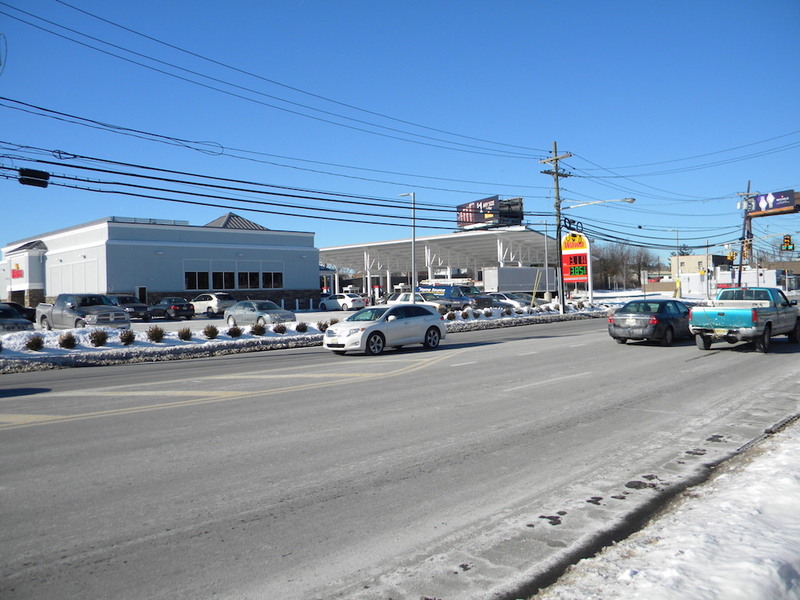 The next photo series shows various site properties before and after remediation. 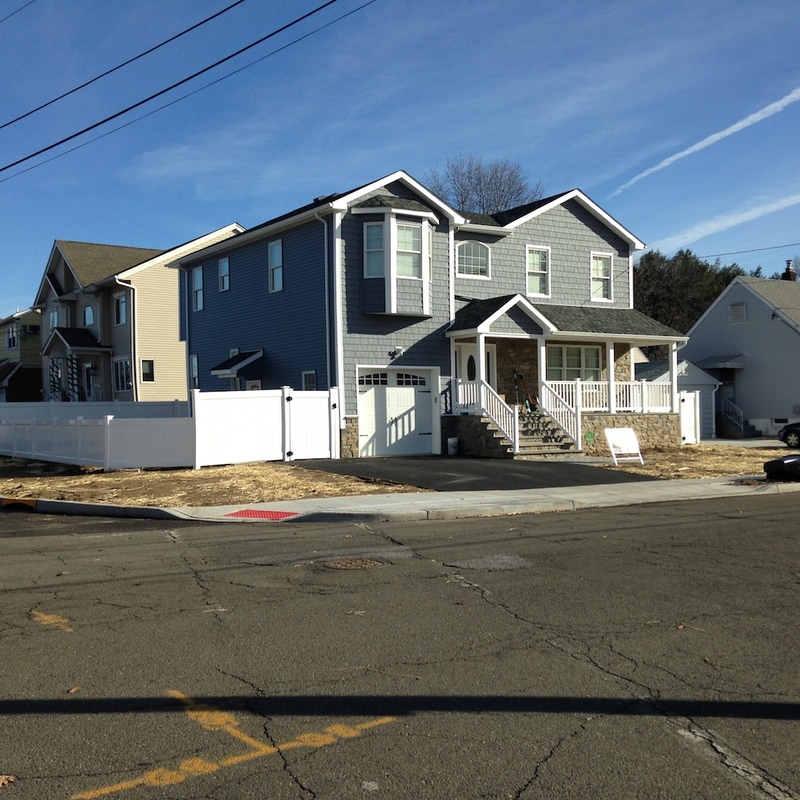 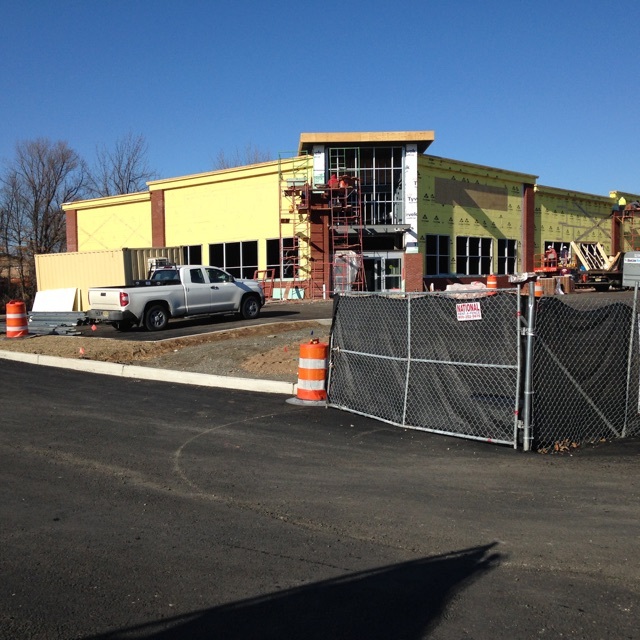 Property improvements or new development on these properties generate additional tax ratables for their communities.